Rockville RHB70 Compact all in one home theater speaker with 4" subwoofer and (2) 3" speakers built in. 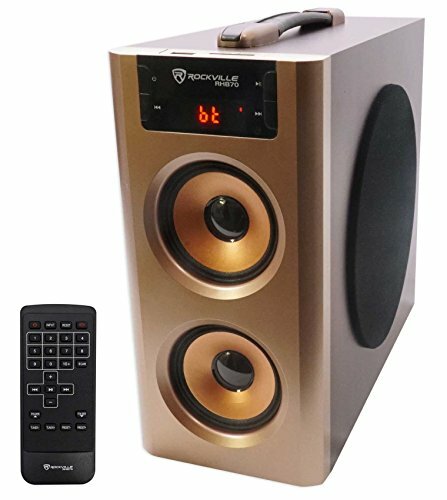 Built in high powered amplifier with incredible sound quality. 2.1 channel design with (2) 3" speakers for highs and a 4" subwoofer for mids and lows. Built in Bluetooth to stream music from any phone, tablet, or other Bluetooth device. Uses top quality Bluetooth chip with enhanced data rate and 35 foot range. Built in USB input to play back songs stored on a thumb drive (up to 32GB). Built in SD memory card slot allows playback of audio stored on a memory card (up to 32GB). RCA Aux input allows easy connection of a laptop, computer, TV, phone, tablet, or any other audio device. LED display to view Volume, Track details, FM channels and other details. Convenient digital controls on front panel. Remote control with direct track selection. Fully wooden enclosure for pure sound. Cherry wood enclosure finish. Frequency response: 40Hz - 20 KHz. Channel Separation: ≥ 50dB ( 1 KHz ). Output Power: 25 Watts RMS, 50 Watts program power, 100 watts peak power. Input Voltage required ---110V AC. Unit dimensions (inches): 4.73" W x 9.65" H x 10.64" D. Unit Weight: 5.43 LBS. If you have any questions about this product by Rockville, contact us by completing and submitting the form below. If you are looking for a specif part number, please include it with your message.